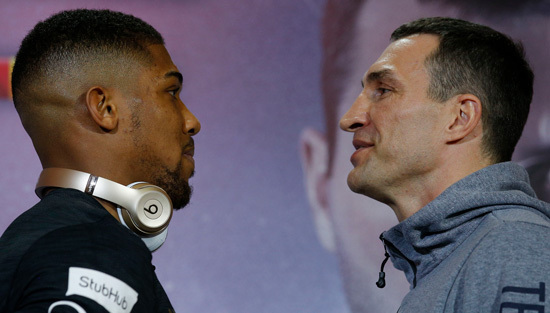 Billy Joe will get Shorty - but can Wlad get shirty? Billy Joe will get Shorty – but can Wlad get shirty? Never mind the coming contretemps at Wembley. 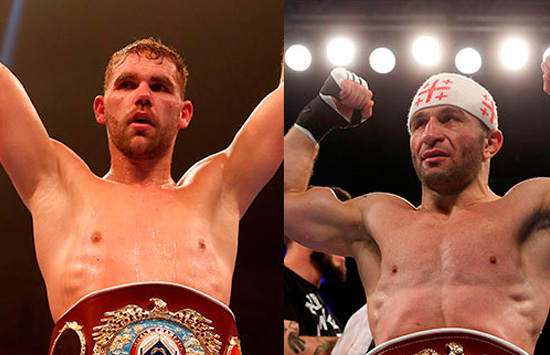 The pugilistic pairing I am looking forward to most in the coming weeks is Billy Joe Saunders against Tommy Langford’s vertically challenged nemesis, Avtandil Khurtsidze. It is going to be a fun night – and a fun fight as the WBO world middleweight champion attempts to Get Shorty. From what we saw of his fifth round demolition of British champion Tommy Langford – the last time I saw a left hook explode with such accuracy and venom was when both Henry Cooper and Joe Frazier put Muhammad Ali on the floor – the gobby Georgian, at 5ft 4in a sawn-off Mike Tyson, is one hell of a character. As Saunders himself is not slouch when it comes to being somewhat larger than life, particularly with the verbals, possessing the gift of the gab as well as the jab, BT and BoxNation fans can sit back and enjoy a spectacular show in London on July 8. It will be, quite literally, a belter. With the preceding clashes between unbeaten home town boy Josh Warrington and seasoned former world super-bantam champ Kiko Martinez in Leeds on May 13, and the mouthwatering IBF world super-featherweight collision between the sensational Sorcerer’s Apprentice, Floyd Mayweather’s star pupil Gervonta Davis, and Britain’s redoubtable Liam Walsh at the Copper Box just a week later, the fireworks season is set to come early for fight fans. For me, the big bang will happen when Billy Joe goes to war with Khurtsidze. The build-up will be as fascinating as the fight and despite the supreme confidence of the Georgian’s US backers I see him being entertaingly cut down to size, so to speak. All this plus the intriguing possibility of the bill featuring the return of Tyson Fury, still the main man out there in the heavyweight division despite his enforced inactivity. Fury’s enormous shadow looms large over Saturday night’s proceedings at Wembley where it will be a case not of Get Shorty but whether Wladimir Klitschko can get shirty. He needs to show more bile and gumption than he did when Tyson tamed him if he is to regain his reputation –and his titles – against Anthony Joshua. For him it has to be spite night. Sixteen years separate the super-heavyweight Olympic gold medals won by Joshua at London 2012 and Klitschko at Atlanta 1996. The fact that they now face each other in a world heavyweight title fight represents an unusual slice of boxing history. For it is indeed rare that those who have acquired the ultimate Olympic glory at either heavyweight or super-heavyweight go on to box a fellow Olympic champion at the same weight for what is still the richest prize in sport. Rare but not quite unique. As far as I can ascertain it will be only the third time that this has happened. Four years ago Klitschko himself defeated the Russian super-heavyweight champion of Athens 2004, Alexander Povetkin, in Moscow. But before that you have to go back 40 years, to 1973 in Kingston, Jamaica, when the then ogre that was George Foreman, the Mexico City 1968 champion, virtually clubbed Tokyo 1964 winner Joe Frazier into orbit. Hang on a mo, I hear some ask. What about Muhammad Ali against both Frazier and Foreman? Didn’t these clashes feature Olympic heavyweight champions too? It is a common misconception, for Ali’s Olympic title was won as a precocious 18-year-old light-heavyweight in Rome 1960 when he was Cassius Marcellus Clay. It was the same when American Pete Rademacher, Olympic heavyweight champion from Melbourne 1956, met world champion Floyd Patterson in his first pro fight. Patterson’s own Olympic title came as a middleweight at Helsinki 1952. Two other Olympic heavyweight champions who did meet in professional combat in 1991 were Lennox Lewis, the Seoul 1988 gold medallist, and Tyrell Biggs, the champion at Los Angeles 1984. However, neither held the world title at the time, although Lewis was later to do so. And so to April 29, 2017. Joshua, 27, heads into the contest with Klitschko giving away 14 years in age and 50 contests to the vastly more experienced 41-year-old Ukrainian. But he believes his comparative youth will give him an edge. It sees Big Josh, the reigning International Boxing Federation (IBF) world heavyweight champion, defend his title against a legend of the sport. The vacant International Boxing Organization (IBO) championship, as well as the World Boxing Association (WBA) super title, will also be on the line. .
Hamburg-based Klitschko has held all three world titles and has only been defeated four times in 68 professional fights during a stellar boxing career. When they won their respective Olympic titles their only reward was the circular piece of gold bullion. On Saturday it is reckoned they will each be enriched by some £15 million. Undoubtedly, this by far is Joshua’s toughest test. The most experienced heavyweight boxer in the world, full of guile and savvy, against a young man who, despite his World Championship status, is still a relative novice. Joshua has steamrolled his way through his 18 professional fights since joining the paid ranks a year after winning gold in London, beating all his opponents by knock-out or stoppage. But none have been anywhere near Klitschko’s league, including those in his IBF title fights. That said, Klitschko hasn’t fought since an astonishingly lacklustre performance against Fury saw him lose his WBA, IBF and WBO titles in November 2015. He was uncharacteristically timid and negative. The Ukrainian aged that night. He appeared nonplussed and bamboozled by Fury’s dancing, prancing and jabbing. He simply did not know what to make of an opponent bigger than himself. I suspect he will find the more orthodox Joshua easier to fathom. And surely he can never box as badly, or make the same mistakes again? He vows to atone for that deeply embarrassing night in Dusseldorf. But has he been away from the ring for too long? No-one doubts his fitness. Is there a more physically attuned 41-year-old in the world? We know Joshua can punch and box but little else about him is evident. Can he take a decent whack? Can he last the championship distance of 12 rounds? Will Klitschko have too much ring savvy? I don’t always agree with BoxNation’s Steve Bunce but he is bang on the button when he says we will know within the first 30 seconds whether Klitschko has come to fight or faff around as he did against Fury. Arguably the most important figure in the fight will be 41 –Klitschko’s age. He is not Krug or Chateau Lafite. He does not improve with age. But Joshua does not have Fury’s capacity for the unorthodox. What you see is what you get. And he has never been beyond seven rounds – so should the bell sound for the eighth and Wlad the Impaler is still in there punching, it will be very interesting. Could it toll the end of Joshua’s brief reign as a world champion? The bookies say otherwise, making Joshua 2/5 on. But I would not be surprised to see Klitschko snaffle a points win.